Desiccated coconut is made from the white, juicy fleshy part of the coconut. It is made by drying out the moisture from the coconut till the moisture content is nearly 3 percent which results in really crisp, bright white dried coconut. This desiccated coconut can be converted into flakes, shreds or even granules. It is mostly used in confectionaries, cakes and puddings. Confectionery items are those items that are predominantly made with sugar and carbohydrates and includes different types of sweets and chocolates. 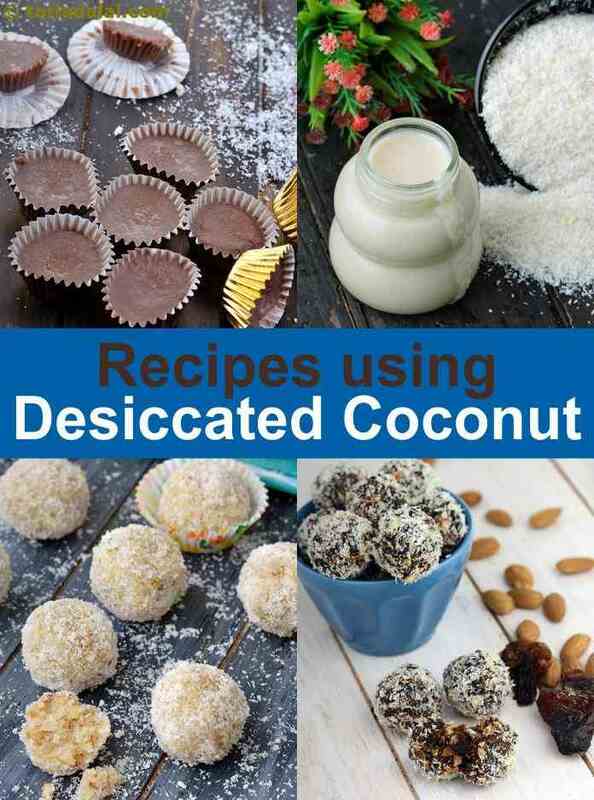 Desiccated coconut is mostly considered a confectioners item because it is used so much in that industry. Eggless Coconut Cookies are crunchy, delectable cookies that can served at fancy tea parties or at even at chai tapris on the road and they will taste equally amazing. Peanut butter and coconut go very well together. And if we add chocolate to the mix, it is a match made in heaven. That is why Chunky Chocolate Peanut Butter Cookies taste like Christmas in our mouth. Speaking of Christmas, it is a festival of cookies, sweets and snow and what better way to celebrate it than with Chocolate Snowballs. Desiccated Coconut looks like little snowflakes and gives a Christmas effect when coated over delicious chocolate balls. A lot of people don’t like eating coconut in this form but rather eat it when the taste is a little subtle. The subtleness comes out when you make Coconut Butter by simply grinding the desiccated coconut. When festival seasons approach, all Indians brush up on their sweet making skills whether it be ladoo, barfi or basundi. Coconut sweets are also ever popular during such festive times. Coconut Ladoos are the easiest to make and the tastiest for sure. They are sweetened with a rich condensed milk and then coated in little flaky desiccated coconut as well. Another unique tasting sweet is Coconut Chikki that can be served at any occasion or even at Raksha Bandhan! Halim Ladoo is a Maharashtrian dessert which is made with cress seeds. This is given to pregnant women to give them proper nutrients but can also be used in festive times as well. Flavored with jaggery for sweetness and coconut for nuttiness, it is an absolute delight. Even though Meetha Pan is not a sweet in the traditional way, it is a long standing tradition to eat it after meals throughout India for that touch of sweetness and freshness that is provided by coconut. Not only is coconut used for sweets but it is also used in various savory Indian recipes. In Maharashtra, an intensely flavored dish called Vegetable Kalvan is made with a rich gravy consisting of onions, tomatoes, and the flavor provider – coconut. Palak Makai Khaas is an easy, delectable Indian party dish that isn’t as complicated as it actually sounds. Hardly taking 10 minutes to cook, the eternal pair of corn and spinach is a made better with a mild hint of coconut running through it. If not as one of the main ingredients, desiccated coconut is tastes amazing when used as a garnish over subzis like Shepu Chi Bhaji. As you already know, this is one of the best ways to use coconut and there are so many innovative ways you can do this. From tropical desserts like Layered Fruit, White Chocolate and Coconut Biscuit that mouth-watering and loaded with so many toppings to more simple things like a Chocolate Coconut Cake, which is perfect for having at any time of the day! Coconut is also a great option for vegans as they don’t consume dairy products. The Coconut Chocolate Vegan Dessert is healthy and only made with cocoa powder and coconut products. It is different in taste but still just as yummy is desserts with dairy. A variation of the famous Agra ka Petha. These delicious creamy white chocolate truffles will testify that nothing is as nice as home-made chocolates. A picture - party tea - time cake with rich fillings of chocolate. A coconut flavoured chocolate crust topped with a delicious, creamy white chocolate and pistachio filling. Surprise your friends with this delicious pastry. Suitable for any occasion. The traditional tea - time cakes, with the delicious flavour of desiccated coconut.